Home » Meat » Beef » What’s For Dinner? Have you ever tried to design a meal around a bottle of wine? If not: you’re not alone. This is a challenging thing to do, if you want to do it well (just to state the obvious: I want to do it well). For all of you wine fanatics out there, this post is definitely for you! So, let’s get started! This may seem trivial, but remember: we’re going to design a meal around this bottle of wine (or, maybe you want a few bottles?). Are you a red wine drinker? Or white? Do you like your wine bubbly? Do you like a bit of acid in the wine? Or do you like it fruity? All of these things are very important when you’re choosing the bottle, and when you’re designing the meal. For this meal, I will be using the bottle in the picture above. 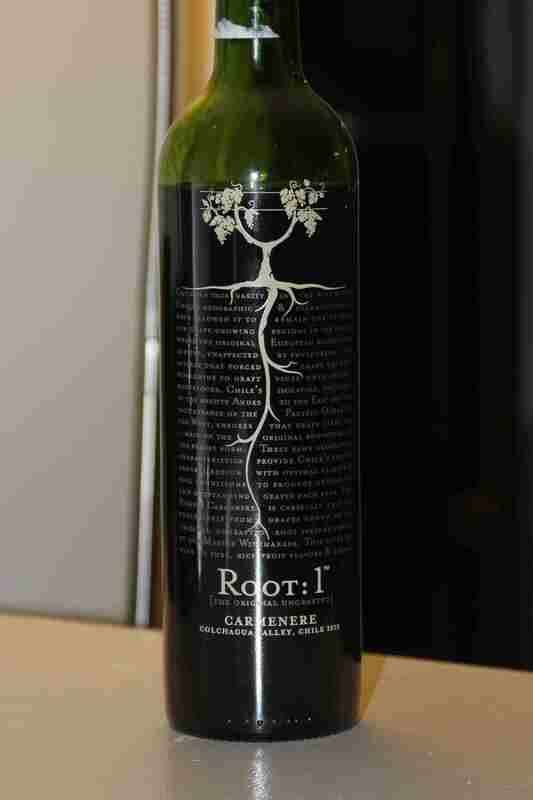 Root: 1 Carmenere is one of the favorites in my house. We enjoy this wine so much, we typically buy every bottle the store has when we find it. Fortunately for me, that usually only amounts to 2 or 3 bottles. To maximize the enjoyment of that bottle of wine, we have to take in to account the flavor, acidity, and tannins. This wine is slightly acidic, very little tannin, and it has a rich chocolate fruity flavor. Like chocolate dipped strawberries. It will be best enjoyed with a hearty meal, like a roast, with a sweet vegetable side, like mashed sweet potatoes. But since I’ve already done those this week, I’m going to have to look for a different meal to compliment this bottle. Open the bottle of wine first. Before even worrying about the food, you should open the bottle of wine, and place it somewhere it won’t be bumped in to so that it can breathe. Now you can turn your attention to the food. Start the steaks next, and then make the salad. In a frying pan with a lid, put the steaks in with 1 tablespoon of coconut oil. Sprinkle just a pinch of sea salt and pepper on the top of the steaks, and set the heat to medium low, a 3-4 on a 10 scale. Put the lid on, and let it begin cooking. While the steaks are cooking, put some olive oil in another frying pan, turn the heat on to low, and add the porcini mushrooms, carrots and sun dried tomatoes. This should also be covered. Make sure this is on the lowest heat, so that the olive oil is not unnecessarily oxidized by the heat. This will be cooking until the steaks are done, so stir occasionally, to ensure that the mushrooms and carrots have even access to the heat. With the steaks and mushrooms cooking, turn your attention to the rest of the salad. In a large salad bowl, add the salad mix, and the cilantro leaves. Now turn your attention back to the steaks. After they’ve been cooking for about 5 minutes, turn the heat to high, and let them sit on the same side as they started on for approximately another 30 seconds, or until they are sizzling loudly. Flip them, and turn the heat back to medium, and put the lid back on. About 3 more minutes, and turn the heat back to high for approximately 30 seconds, or until they are sizzling loudly. Flip them one last time, heating the first side again for about 30 seconds, to ensure that both sides are seared. Now turn the heat off, and remove the pan from the burner. At this point, you should remove the porcini mushroom, carrots, and sun dried tomatoes from the pan and add them to the salad. As soon as the mushrooms and carrots are in the salad, squeeze the lime over the top of the salad, and mix the salad thoroughly. This dish should be served on a large dinner plate. As with the food preparation in this meal, attend to the wine first while serving the meal: Pour the wine first, and serve. It is important that you and your guests get to sip at the wine to get their appetites started and ready. Serve the steak next. Then, making sure the the salad is mixed thoroughly, serve a healthy portion of salad (at least twice the volume of the meat) on the plate around the meat. For more meal ideas and suggestions, check back at Urban Paleo Chef daily for “What’s For Dinner?” If you have questions, comments, or if you really liked the food, please post comments! Dude! This post is info packed! Thanks! I’m so glad you liked it! It’s comments like yours that keep me going! Also the food… let’s not forget the food! By the way, it came out great!